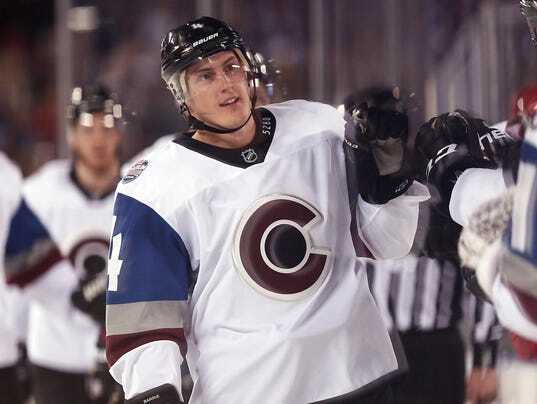 Defenseman Tyson Barrie and the Colorado Avalanche endured an arbitration hearing Friday. But they won’t get to find out the ruling from the arbitrator as the two sides agreed to a four-year, $22 million contract Sunday afternoon, according to Sportsnet’s Elliotte Friedman. The arbitrator, Elizabeth Neumeier, had 48 hours to announce her decision. Colorado argued that Barrie, a restricted free agent, be paid at an average annual value of $4.125 million for the next two seasons. Barrie asked for a one-year $6 million deal. He got $5.5 per season. The 25-year-old, right-shot defenseman has developed into an offensive catalyst, registering 25 goals and 102 points over the past two seasons. Barrie has averaged 1.15 points per 60 minutes at even strength during that timeframe, 10th among defensemen who have logged at least 2,000 minutes, according to stats.hockeyanalysis.com. He had 13 goals and 49 points in 2015-16.